Outfielder Tyrone Taylor (left) and Left-handed pitcher Mike Strong (right) were transferred to Double-A Huntsville this afternoon. Earlier this afternoon, Brevard County Manatees outfielder Tyrone Taylor and left-handed pitcher Mike Strong were transferred to Double-A Huntsville. 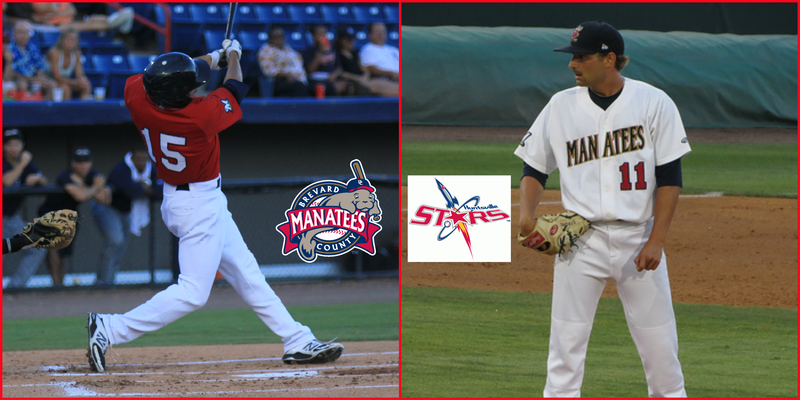 Both players, who were so key to the Manatees success in 2014, will try and help the Stars emerge with their first Southern League title since they split the championship back in 2001. Lets take a look back at some of the memorable moments from Taylor and Strong’s time at Space Coast Stadium. The talented 20-year-old lit up the Florida State League with his quick bat, smart baserunning and his stellar defensive play. Taylor leaves the FSL leading the league in at-bats (507), hits (141) and doubles (36). He is also tied for the league-lead in games played with 130. Taylor heads to Double-A in the top 10 in several other categories. He is fifth in total bases (201), sixth in RBI (68), eighth in runs scored (69) and tied for eighth in stolen bases (22). Taylor has had a few memorable single-game performances, as well. Back on April 29, he became the first player in Brevard County’s 20-year history to hit for the cycle. In Clearwater, Taylor went 5-for-5 with five runs scored to set career-highs. He also walked and drove in three in a 20-0, Manatees rout. On June 17 against Dunedin, Taylor went 4-for-5 with a double and a then-career-high four runs batted in. The southpaw has been one of the unsung heroes of the Manatees pitching staff in 2014. Primarily used as a reliever for most of the season, Strong had a 2.42 ERA and four saves as a key cog in the back of the Brevard County bullpen. In the second half, Strong was untouchable with a 1.74 ERA in 14 appearances (six starts). In 51.2 innings, he struck out 52 and yielded just 37 hits. Strong also was 2-for-2 in save opportunities out of the bullpen. He was elite in August, leaving with the second-most strikeouts in the FSL with 32. Strong also exits with the fourth-best WHIP (1.00) and batting average against (.215) and the seventh-best in the league in ERA (2.42). This past weekend in Clearwater, he reflected on some of his favorite 2014 memories. The Manatees would like to wish Tyrone and Mike the best of luck, as they head to Huntsville to continue their pursuit of playing Major League Baseball! This past Monday was monumental for Brevard County Manatees right-handed pitcher Jon Huizinga. He shutout the Tampa Yankees over two relief innings to close out an 8-0 Brevard County win. Six outs in a blowout win might sound mundane, but for the 34-year old Huizinga, they were the first outs he had recorded in an affiliated baseball game since 2003. Back in 2002, Huizinga finished a four-year career at Michigan State and wanted to continue his career at the professional level. The right-hander went undrafted, but took a shot in the independent Frontier League with the Kalamazoo Kings. Huizinga deals for the Kalamazoo Kings in the independent Frontier League. The shot paid off. 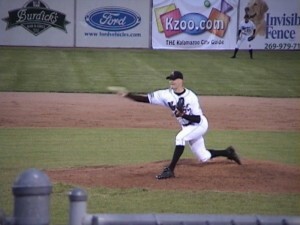 After just four appearances with Kalamazoo in 2003, Huizinga was signed to a minor league contract by the Milwaukee Brewers. Milwaukee sent the right-hander to the Class-A Beloit Snappers and he fared well. 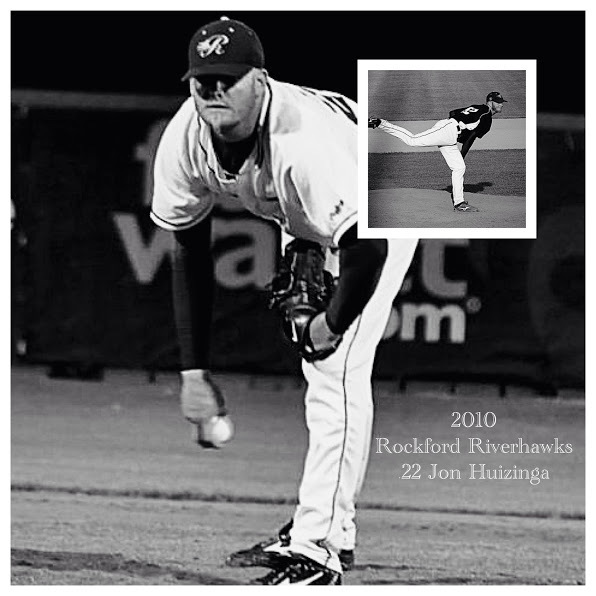 In his first affiliated appearance, Huizinga went 4-0 with a 4.32 ERA. Huizinga made 23 relief appearances for the Class-A Beloit Snappers in 2003. Huizinga’s numbers, however, were not enough to keep him in affiliated baseball. 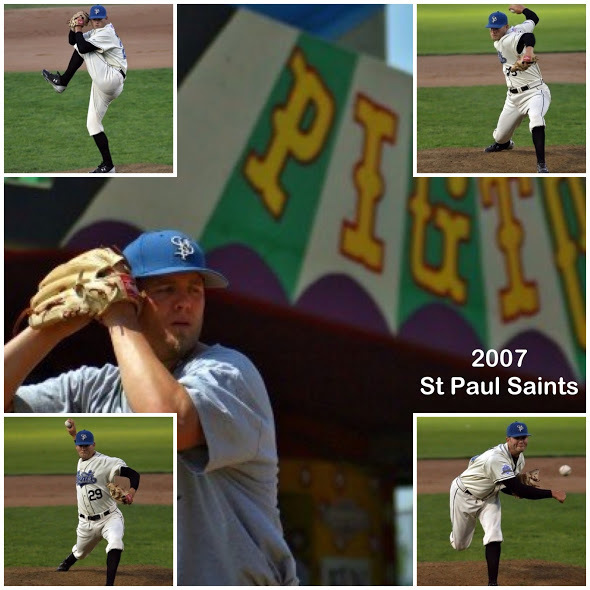 Instead, he went back to Kalamazoo in 2004 and pitched 21 innings before suffering a devastating arm injury. Doctors told Huizinga he was finished. The 24-year old righty, however, did not think so. He went from doctor-to-doctor, until somebody told him he could make a comeback. 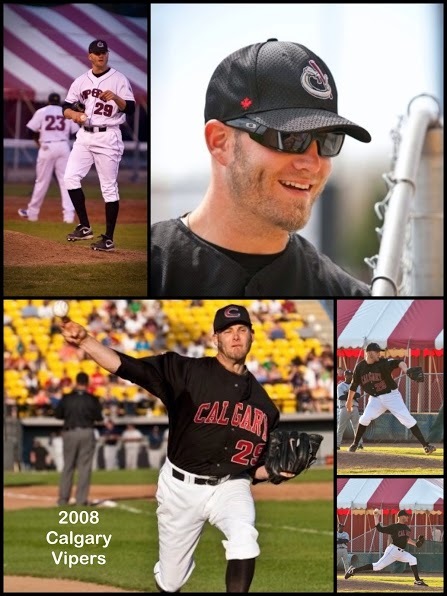 Determined to stay in baseball, Huizinga reinvented himself with a nutrition plan that has helped sustain the right-hander and yielded him eight more seasons of independent professional baseball after doctors told him he was finished. Finally, after all of that work, Huizinga got another shot at the affiliated ranks. It took a couple of days after being signed and sent to Brevard County for Huizinga to appear in a game. But, when he did, the veteran shut the door. He allowed a single in both the eighth and ninth innings, but erased both runners with double play balls and recorded the final out of the Manatees’ victory with a ground ball to shortstop. How historic was Johnson and Magnifico’s feat? The Brevard County Manatees became a Milwaukee Brewers affiliate in 2005. Since that partnership began, the ‘Tees have never pitched back-to-back complete game shutouts in a doubleheader. The ‘Tees had two chances to accomplish the feat back in 2008. On June 24, Jeremy Jeffress pitched a complete game, three-hit shutout against the Dunedin Blue Jays in the opener of a home doubleheader. Brevard County lost game two, however. Later that year, on August 17, Chris Cody dominated the St. Lucie Mets on the road with a complete game shutout in game one of a twin-bill. The Manatees won game two, but used three pitchers and allowed two runs. The double-shutout performance on Saturday was not just historic in the context of the Brevard County Manatees. It was also historic for the entire Brewers’ organization. Since 2005*, no Milwaukee Brewers affiliate, from the rookie level all the way up to the major leagues, has accomplished what Johnson and Magnifico did against Clearwater. Just like the Manatees did in 2008, several Brewers affiliates came close with complete game shutouts in the opener of a doubleheader: Triple-A Nashville did three times, as did Double-A Huntsville. In 2013, current Brevard County starter Tyler Wagner pitched a complete game shutout in game one of a twin-bill on May 8, but the ‘Tees lost game two. 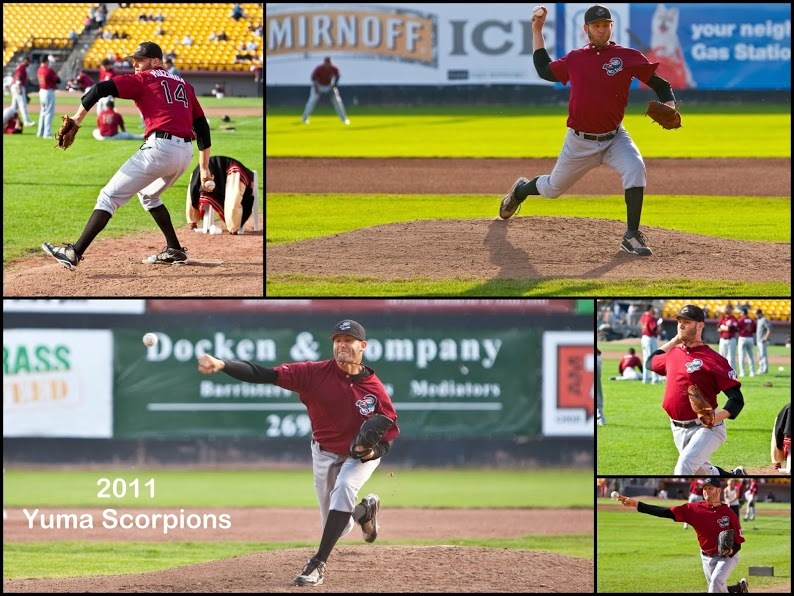 The Timber Rattlers had a similar fate on an April day in 2011, as well. No other affiliate has even come that close, including the big league Brewers. 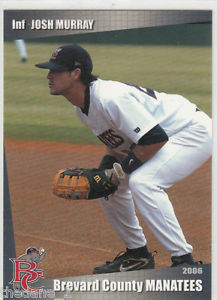 In 2005 and 2006, Josh Murray was an infielder for the Brevard County Manatees. Murray was a former second round pick of the Milwaukee Brewers out of Jesuit HS in Tampa, FL, but left baseball after the 2007 season. Murray has now found notoriety on the ABC hit show The Bachelorette and last night, a national television audience watched as Andi Dorfman handed the final rose to Murray and the former ‘Tee proposed. A former second round pick of the Milwaukee Brewers, Josh Murray played five games for the Brevard County Manatees in 2005 and 29 games in 2006. Congratulations to Josh and Andi! It’s 2014 and with social media, professional athletes’ off-the-field lives are more accessible than ever. Don’t believe us? Check out the ever-popular “Minoring in Twitter” segments from MiLB.com’s PROSPECTivs Blog that give you a look at the best tweets the minor leagues have to offer. Brevard County has its own cast of entertaining characters that show their more personal sides on Twitter, so we thought we’d share. Tommy Toledo may have moved on to Double-A, but how could we NOT lead with this? Oh, so THIS is how you celebrate a walk-off win? The boys celebrating the walk off tonight with a movie. The purge. Better be better than the first one. Like our new ‘Tees on Twitter segment? Have some more tweets you think we missed? Drop us a comment or tweet at us @BCManateesRadio. Miss the Manatees’ walk-off win over the Mets? Fear not, we’ve got you covered with full video and reactions from last night’s hero, Jose Sermo. For the first time since 2011, the Brevard County Manatees had a participant in the SiriusXM All-Star Futures Game. Manatees starting pitcher Jorge Lopez represented the Milwaukee Brewers as a member of the World Team at Target Field in Minneapolis, Minn. Though the World fell to Team USA, 3-2, Lopez was effective in his brief outing and from all we can tell, he had a lot of fun with the whole experience. 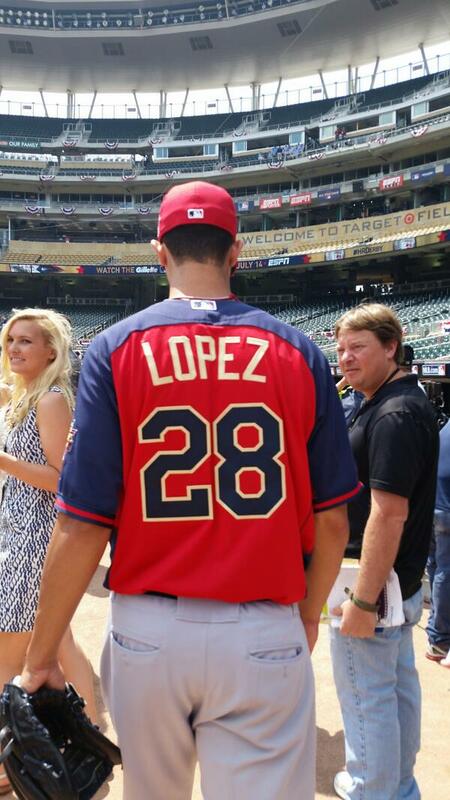 Take a look and a listen to Lopez’s Futures Game experience. Good luck to @yabiee18 in todays future game! Represent!!! Jorge Lopez steps onto Target Field before the 2014 SiriusXM All-Star Futures Game. 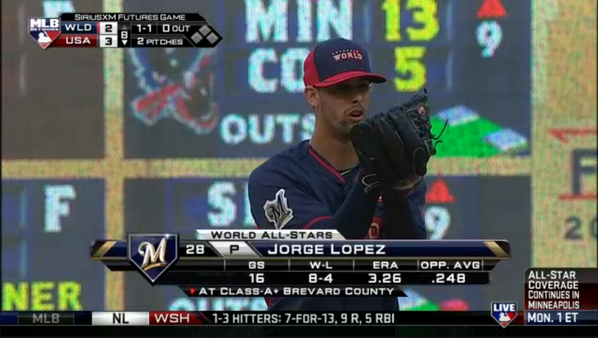 Jorge Lopez gets ready to make his Futures Game debut. Lopez only faced one batter in the bottom of the eighth inning, but he did his job. The ‘Tees starter retired fellow Florida State Leaguer J.P. Crawford, of the Clearwater Threshers, on a ground out to second base. Jorge Lopez gets fellow Florida State Leaguer J.P. Crawford to ground out to second in the 2014 SiriusXM All-Star Futures Game. After the game was over, Lopez enjoyed a scenic bicycle ride through the streets of Minneapolis. Since May 9, Manatees pitcher Jorge Lopez leads the Florida State League several categories, including ERA and WHIP. Since May 9, you would be hard pressed to find a better pitcher in the Florida State League than the Manatees Jorge Lopez. Despite a shaky start to the season, Lopez showed flashes of the dominance he would go on to display. In his first six starts prior to that May date, Lopez had a record above .500, but his ERA hovered over five. However, starting with that night at Space Coast Stadium against the Daytona Cubs, Lopez has been among the FSL’s best. Since that night, Lopez has the fifth-lowest earned run average (1.73) and WHIP (1.02) in the entire league. Lopez has also been impressive in how he has dominated opponents. The Puerto Rico native has induced a plethora of weak contact, as he has the third-best groundout-to-airout ratio (2.26) in the league during this span. As well, Lopez has a 5-1 record in 58 innings over these last nine starts. What is even more impressive, the former second round pick has allowed just 42 hits in those outings compared to 38 strike outs. Very few pitchers in the league have been on the same level as Lopez over the last few months. Teammate Tyler Wagner ranks third in the FSL in ERA (1.63) since May 9, but has thrown 8.1 fewer innings. During this stretch, Lopez has also made some of the best starts of his professional career. On May 27 against the St. Lucie Mets, Lopez worked into the ninth inning for the first time as a pro en route to what was his sixth win of the season. The righty was removed before he recorded an out in that final frame, but allowed just four hits over eight-plus innings and allowed just one measly unearned run. Lopez followed that performance up with another dominant outing, this time against the Dunedin Blue Jays, on June 16. He shutout the first-half champions of the North Division over seven innings. Lopez allowed just five hits and struck out six. His last masterful performance came on June 26 against tonight’s opponent, the Lakeland Flying Tigers. Lopez tied his career-high with an eight inning night and allowed just two runs on five hits. That day, Lopez also recorded his first career complete game, as the game was shortened to eight frames due to rain. As a reward for all his success, Lopez will head to Minnesota next week to participate in the Sirius/XM All-Star Futures Game. 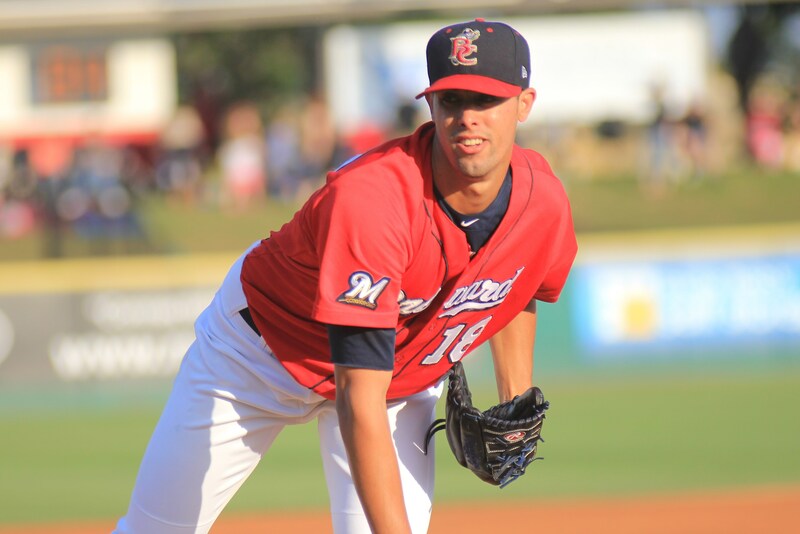 The right-hander is the only Brewers farmhand to be selected to the showcase and is the first Manatee to receive the honor since fellow righty Tyler Thornburg was chosen in 2011. Tonight in Daytona Beach, the Brevard County Manatees have a chance to do something they have not done since 2007: Win the I-95 Rivalry Trophy against the Daytona Cubs. That year happened to be the inaugural season of the I-95 trophy challenge, the brainchild of the Manatees 2007 intern staff, led by General Manager Buck Rogers. The ‘Tees won the season series against the Cubs, 11-7, but have not won it since. They now just have to win one of the next four meetings with Daytona to capture the seven-year old trophy, starting tonight at Radiology Associates Field at Jackie Robinson Ballpark. Of course, today’s ‘Tees don’t remember the ’07 team that knocked off Daytona in the regular season. Do you? 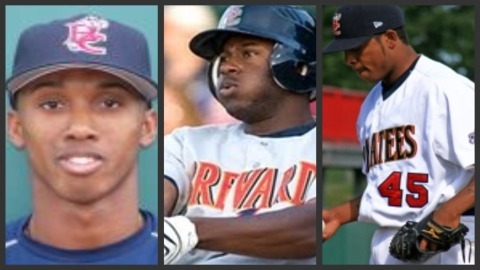 Nine members of the ’07 Manatees now have Major League service time, including current Kansas City Royals SS Alcides Escobar and CF Lorenzo Cain. That pair went to KC in December of 2010 in exchange for former Cy Young award-winning right-hander Zack Greinke ans SS Yuniesky Betancourt. Alcides Escobar, Lorenzo Cain and fellow-former Manatee Jeremy Jeffress were dealt in 2010 for Zack Greinke and Yuniesky Betancourt. That team also featured a name that ‘Tees fans of today and years past will recognize. Current Brevard County hitting coach Ned Yost IV played first base for the Manatees that year. Brevard County and Daytona split the first 10 games of the series, including a doubleheader split at Space Coast Stadium on the final day before the All-Star Break. When play resumed in the second half, the ‘Tees took control of the series. The Manatees won both games of a home-and-home with the Cubs behind a heavy-hitting performance by 3B Mat Gamel. One of Brevard’s top RBI men that season, Gamel drove in three runs over the two-game span with a homer and a triple. That two-game sweep gave the ‘Tees momentum. Brevard County took two-of-three games in the team’s next meeting with Daytona in late July. Now leading the series, 9-7, Brevard County needed just two more wins to ensure ownership of the first I-95 Trophy. Brevard County traveled to Jackie Robinson Ballpark to play a three-game series against the Cubs over two days in late August. The first day of the trip presented a chance for the Manatees to take home the trophy with a doubleheader sweep, but it was not going to come easy. The ‘Tees trailed the first game of the doubleheader late. In a game devoid of scoring, the Cubs held a 1-0 lead going into the top of the seventh. Brevard County then tied the game in the 11th hour. Daytona brought in Darin Downs out of the bullpen to close the game, but Michael Bell drilled the first pitch of the inning over the left field wall to even the score. The Manatees and Cubs headed to extra innings and Brevard capitalized on a big Daytona error in the eighth. With one out, Cain reached on a fielding miscue by SS Jonathan Mota. Cain then stole third and Yohannis Perez delivered a sacrifice fly to score the go-ahead run and the ‘Tees went on to win, 2-1. The Manatees fell in game two of the doubleheader, 12-0, but came back swinging the following night. In a slugfest that featured 29 hits between the two sides, the Manatees found themselves on top heading into the ninth. Brevard County was on top, 8-7, but added three more runs in the top of the ninth to take a commanding 11-7 edge. Daytona, however, did not go quietly. Ryan Harvey led off with a home run and the Cubs tacked on two more on a single and a bases-loaded walk. The Cubs had the tying run on third and the winning run on second with two outs, but Ryan was there once again to save the day out of the bullpen. He induced a game-ending ground ball to second base. Bell fielded it and stepped on the second base bag to end the ballgame and bring the first ever I-95 Trophy to Brevard County. Daytona and Brevard County were scheduled to play twice more at the tail end of the season, but the games were cancelled due to rain. Since then, the closest the ‘Tees have come to winning the rivalry was in 2009 when the two sides tied, 9-9. Two games were cancelled that year, as well. Brevard County will send LHP Hobbs Johnson to the hill against LHP Nathan Dorris tonight in Daytona. If you can’t make it to the game, you can tune in to hear the ‘Tees go for the I-95 Trophy at ManateesBaseball.com.